Marshmallow Brownies – Create, Make & Bake! 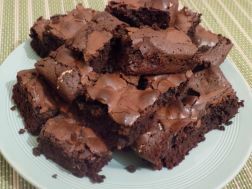 Everyone liked these, I think it is the best brownie recipe I’ve found, needless to say we saved the recipe. It’s sort of a moderate difficulty, not for newbies though. 1. Put the chocolate and butter into a microwave-proof bowl and microwave until melted, stir every 10-15 seconds the prevent burning. 2. Beat together the eggs and sugar until a light froth appears on top, mix into the chocolate mixture. Preheat oven to gas mark 4/ 180*C/ 350*F, line and roughly 22” ‘brownie tin’ with grease-proof paper. 3. Add the rest of the ingredients and mix until smooth and fudgey-looking, pour into tin and baking for 30 minutes or until top is visibly cracked. Enjoy!! Pingback: Cheesecake Brownies – Create, Make & Bake!